In Liz Harris' world, you should never know what to expect. The Portland-based musician is one of the most intriguing artists in the world, not just because of the beguiling music she releases on a consistent basis, but also because of how she presents it. Harris is a staunchly independent artist who does everything on her own terms. 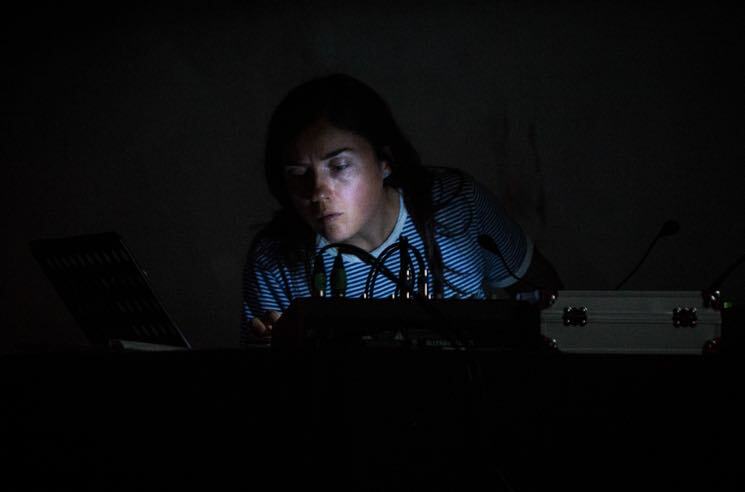 If she feels like pressing only 500 copies of an album by her beloved project Grouper, she will, regardless of the demand (although eventually second and third presses follow). And if she performs a show, you might not know if you're getting a Grouper performance, a solo performance or a collaborative performance with any one of her peers. When last night's (June 9) show was originally announced, there was some confusion as to whether or not Grouper was actually billed. But as the official ads explained, this was Harris' performance of Hypnosis Display, the two-year-old audio-visual project she developed with filmmaker Paul Clipson. Described as "a meditation on contemporary America in sound and image… a mind's-eye trip through landscapes of American myth making," Harris sat stage right with a table covered in cassette players, a mixer and a mic. As soon as the music and film commenced, the audience collapsed onto the floor in near-perfect unison, to give the performance the seated respect it deserved. Clipson overlapped 16mm images, often bestowing a dichotomy of sorts. Coloured visions of tranquil, rain-splashed vegetation were intercepted by stark, black and white scenes of industrial acreage; free roaming goats frolicking in the woods bled into static offshore oil rigs and shipping containers; as a whole, you could sense the urgency to portray the ancient, natural world's ruin at the hands of modern, city-living society. Harris used contrasting layers of beatific vocal harmonies, interview samples, field recordings and effects to weave in and out of the imagery, carefully following its tone. It was easy to get lost in the immersive domain the pair were staging due to the ambient textures from both media, but come the hour-mark, it coalesced to form something sinister. The tone began to shift, and soon observers were subjected to a nightmarish, Lynch-ian twist of ominous noise and hurtling shots of seedy cityscapes. When the 75-minute performance ended with a deep surge of bass, it was hard to immediately process everything that Hypnosis Display represented. Although it ran a little longer than necessary, Harris and Clipson assembled a mesmeric and troubling act that should linger in the minds of anyone who experiences it. HYPNOSIS DISPLAY TRAILER from Paul Clipson on Vimeo.